RIO DE JANEIRO, BRAZIL – In anticipation of this year’s Carnival celebrations, Rio de Janeiro’s historic Theatro Municipal is hosting specially-themed guided tours that explore the history of Carnival in the city since the end of the 19th century. 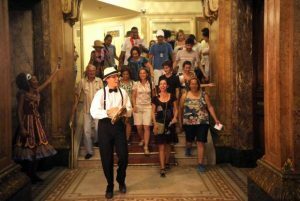 On the special Carnival-themed tours, Visitors make their way through the Theatro Municipal while learning the history of Carnival celebrations in Rio de Janeiro, Tomaz Silva/Agência Brasil. Theatro Municipal’s guided tours are part of the venue’s regular programming, taking place on Tuesdays through Saturdays in both the morning and evening. The Carnival-themed tours began on February 2nd, continued on the 3rd, and will end on the 4th. The tour then makes it way to the Varanda Rio Branco, where visitors learn about early celebrations and parades including the “Cordões” and blocos like Cordão da Bola Preta, which held its first procession in 1918 and grew to become the city’s current biggest bloco celebration. Next, in the Theatro Municipal’s concert hall visitors learn about the gala balls held between the 1950s and mid-1970s. Finally the tour makes its way outside to the Boulevard da Avenida Treze de Maio, where visitors are encouraged to throw confetti and streamers while singing the marchinhas (samba marches) they’ve learned during the tour. For more information about the tour, see the Theatro Municipal website or call (21) 2332-9191.